First Line: In my dreams, the dead can speak. Cedar Valley, Colorado is filled with hikers and campers in the summer and skiers and snowboarders in the winter, but beneath the beautiful scenery that surrounds the residents lie some pretty gruesome secrets. Almost forty years ago, two little boys disappeared without a trace until Detective Gemma Monroe uncovered their bones a few years back. Their murders remain unsolved, attributed to a ghostly monster locals call the Woodsman. Now a young man has been murdered in a seedy little traveling circus, and as Gemma tries to find justice for the victim, she's going to uncover secrets that will shake this Colorado community to its foundations. This is a debut novel that doesn't read like one. Emily Littlejohn has a beautiful, lyrical writing style that captivated me from beginning to end. She's also created a nuanced main character that I definitely want to read more about. Gemma Monroe's parents were killed in a car wreck, and she was raised by her grandmother who is now in the grip of dementia. Gemma is pregnant, and her partner is off in the wilds of Alaska on a geological survey. Their relationship is complicated; Brody is a man Gemma loves deeply, and she trusts him with her life-- she just doesn't trust him with her heart. So she's got all sorts of personal troubles compounded by being forced to work with a fellow officer whose ethics have been questionable on more than one occasion. 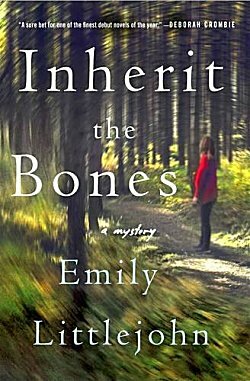 Inherit the Bones has a fascinating premise that kept its hooks in me throughout the book, but it's one you can't really talk about for fear of giving things away. Whodunit was easily deduced by me this time around, but with the character of Gemma, the storyline, and the way Emily Littlejohn writes, I didn't care. I'm looking forward to more. I do like that plot point of the past impacting the present, Cathy. And the setting appeals to me, too. Add a solid writing style in, and I can see why you liked this one. I'm really looking forward to her next book.